Only a few photos from Adri's party the other day, mainly because there were kiddos running around everywhere and I was way too busy to take photos. 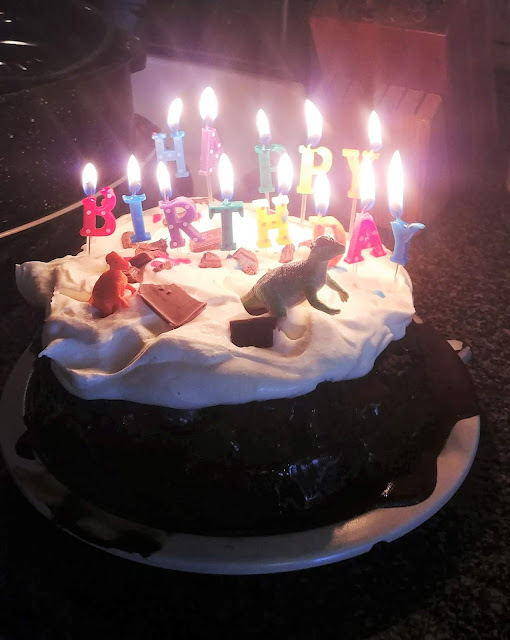 My Baba Goo's only request was a "dinosaur party" and a chocolate cake. Of course she got both, and tons of presents. It's been a rainy week so far here and is supposed to stay that way until Thursday. Definitely does not feel like June weather. I'm headed up to Wesleytown today, while the jeep is in the shop getting worked on, and then tonight sister Julia is coming over here to our place to hang out. We have all been taking each day at a time. Lots of emotions still going on, and there is some unresolved stuff that needs to be taken care of. However, we have each other, and that, honestly is the most helpful thing during this painful time. Thank-you for all your continued kind words and prayers-we still need them! Keep breathing, keep reading your bible, keep remembering her joy in you all and her grandchildren, but mostly her joy in the Lord. Its what made her so loving and kind, so tender. Happy Birthday, to your sweet Adri Rose. My heart is full of compassion and care for you, Rosie. Know you are thought of and prayed for. You are being covered in prayers from so many right now. Not only for You, your dear brothers and sisters, Dad, but also your Adam and precious little ones. You are such a good Mama~! Very cute cake...she will likely always remember!! Glad you are going on doing what one does...day by day...moment by moment sometimes. Asking GOD to be with all of you...whatever each one needs. When a drunk driver took my 20 year old brother years ago, we were not sure any of us would be able to physically live through it all. But GOD was with us...not to say I still do not miss him, plus wonder what his continued presence might have contributed to even the lives of my children...but I can tell you that one day the physical pain you feel will abate...though you may well...and likely will, as I do, still miss my beloved mother most all days of the week...even though I lost mine 17 years ago now. Some people are so special. Our Hope of Eternity has held me together all these years. Blessings dear lady!! What a fun birthday party this looks like! I'm sure Adri enjoyed it all immensely, as did you all. So often, when I felt overwhelmed, I remembered your dear mama's advice... "just do the next thing, and love and care for the people in your life." It helps so much to cope with things out of our control.